The Dominican religious order established only two friaries in Wales – and one of them was right here. The entire footprint of the main building is still visible. Historians rarely get to see such a complete record of a medieval friary’s size. The site is a Scheduled Ancient Monument and has a fascinating past – you’ll find more information on the boards nearby. The order was founded by St Dominic in 1216. Dominicans became known as “black friars”, because they wore dark hooded overclothes. Their friary in Cardiff was established in 1256. It included an infirmary and a well. In 1536, Parliament ordered the closure of monasteries, abbeys and other religious houses in Wales and England. The Dissolution of the Monasteries followed King Henry VIII’s decision to sever his country’s religious allegiance to the Pope in Rome. Blackfriars’ Friary in Cardiff was handed over to the state in 1538, and the buildings were soon demolished. The foundations disappeared under soil and vegetation but were excavated by archaeologists in 1887 and 1897, because the third Marquess of Bute wanted the remains examined and preserved. He did the same for ruins near his Scottish properties, including Melrose and Sweetheart abbeys, and the site of Greyfriars monastery in Cardiff. This site was cleared in the 1960s, but its existence is recorded in the name of Greyfriars Road. After excavation, the remains of Blackfriars’ Friary were dressed up as a garden feature. The floor was covered with reproduction tiles, based on the designs visible in fragments of the original tiles. 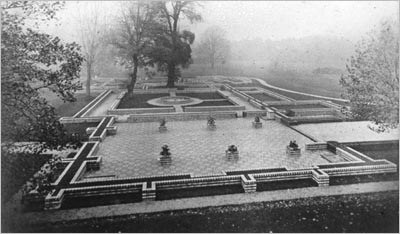 The newly completed feature is illustrated in the photo provided by Cardiff County Council, courtesy of the Mount Stuart Estate. The Victorian tiles were later removed for safekeeping, but you can now see some of them inside West Lodge. Look out for a bench overlooking the ruin which was installed in 2012 with inscriptions of the names of the last known friars. It also bears images of the friary’s coat of arms and some of the artifacts recovered here during the 19th-century archaeological excavations. To the north of the friary foundations is a patch of woodland planted some time after 1824. It was called Old Man’s Wood by the 1860s. Historians believe that other remnants of the friary lie hidden beneath the trees. To continue the Bute Park tour, follow the path you’re on through the woodland, or go back and take the path along the flower borders. Look for the next QR code on the front corner post of the Summerhouse Café.